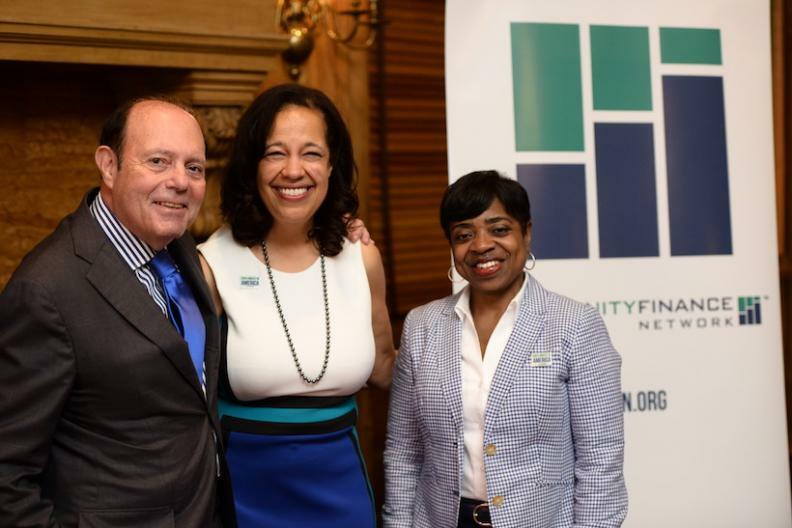 On May 17, after the close of a successful Advocacy Day, OFN staff, Members, Board, and special guests gathered to celebrate CDFIs and welcome OFN’s new President and CEO Lisa Mensah to OFN. Gene Ludwig, founder of Promontory Financial Group, an IBM Company, hosted the D.C. welcome reception and the Ludwig Family Foundation provided support. Gene, a longtime friend of Lisa’s, is a trusted adviser to many of the world's leading financial companies. As a former federal regulator and banker, he sought pragmatic solutions to the credit crunch of the early 1990s and to expanding lending to low and moderate income Americans. Along with CDFI affiliations that include serving as outside director on the Board of ShoreBank, one of the oldest community development banks, he is widely credited with helping President Clinton start the CDFI Fund. Lori Chatman, OFN Board Chair and President of Enterprise Community Loan Fund, welcomed guests to the D.C. reception. Gene recalled first meeting Lisa when he was the comptroller of the currency, back in 1993, and also reflected on being the first CEO Advisor to Lisa’s Aspen Institute Initiative on Financial Security. Gene provided a riveting historic perspective on credit in America, and then introduced Lisa as a champion for underserved communities. Lisa remarked on her enthusiasm at bringing together former colleagues and leaders in the CDFI field in her new capacity as OFN’s CEO and President. Lisa said she is looking forward to continuing the conversation about helping all economies move forward in the months and years to come. Enjoy some fun pictures from the D.C. event in our Facebook album.